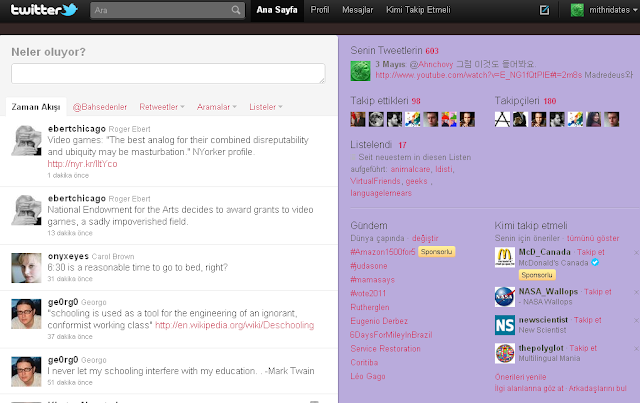 Here's something I missed (also here and here) from about a week ago - Twitter is now in Turkish, its ninth language. The first language to be added on was Japanese, and after that also came Italian, Spanish, Korean, French, Russian, and German. For a site like Twitter that is easy to navigate languages like Japanese, Korean, Russian and Turkish are especially important, since they are fairly large with a relatively low English proficiency. In Western Europe many are capable of navigating sites as simple as Twitter without a translation in their own language, though of course one is always welcome. A Turkish edition of Twitter, one of the most popular social websites in the world with 200 million users, has gone into service. An announcement on the site's blog said that Turkish and Russian had been added. In a study carried out by the company ComScore, Turkey is in eighth place in terms of number of users per capita. In first place is the Netherlands with 26.8%, and Turkish is at 16.6%. The study estimates that there are 4 million Turkish users. The total number of internet users in Turkey is about 35 million, so that seems about right. Let's change my settings to Turkish for a second for a screenshot. Here we go.